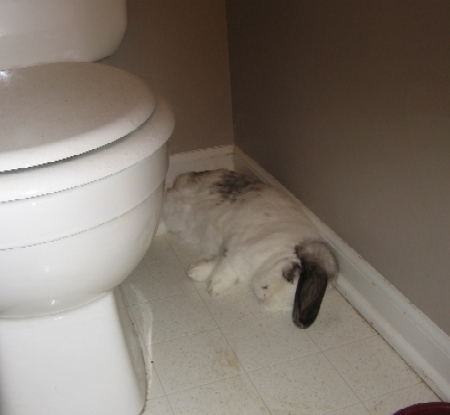 Arliss was dead asleep the other day when I was getting in the shower. She didn’t notice me for a very long time. 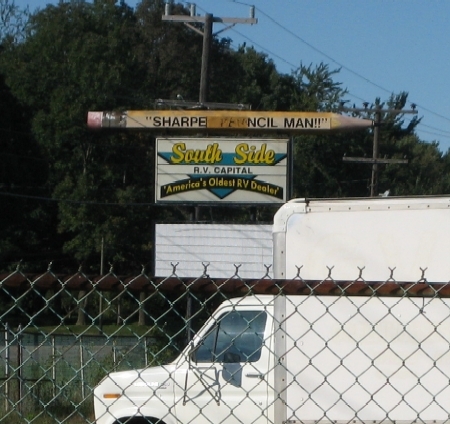 One of my favorite sights between Indy and South Bend is the Sharpest Pencil Man sign. I really don’t know why that’s worth crowing about, and they’ve been out of business for a long time, but I hope the sign never comes down! The reason for the trip: my brother’s wedding. We had a lot of fun watching him dance with his friends at the reception. For once, I wore heels! 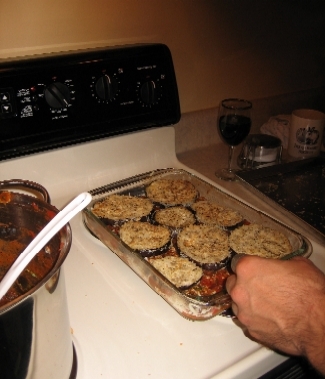 We made a really yummy eggplant parmesan this weekend. David gets most of the credit since he’s the real cook, but I’m getting a little better and maybe someday I’ll actually enjoy cooking… The eggplant slices were coated in bread crumbs, baked, and then layered with a homemade sauce and mozzarella, and the whole thing was topped with parmesan (the good stuff). Recipe from one of the Moosewood cookbooks! 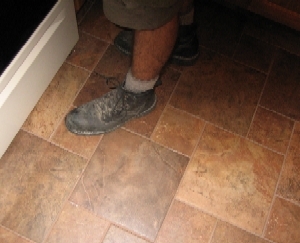 Since I was standing there with the camera, I’ll show off my kitchen floor again. David installed it last winter and I think I finally got over the price tag! I had a root canal yesterday on #5. I was really worried and upset about it (no good reason since I had one last year that was fine), but as soon as the endodontist got going on it, I was fine. There was this bizarre ceiling tile above the patient chair showing two guys riding a bicycle on water. I think it must have been there to distract kids in the chair because it seemed to be one of those “find which parts don’t belong” type of pictures. Apparently XM 25 is the dental channel. This is the second dentist I’ve been to who listens to that channel. 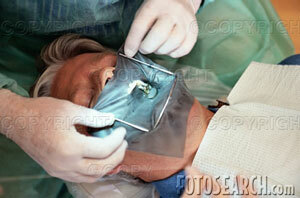 And now I finally know what a dental dam is! I think the one they put on me was chocolate flavored. This is the best picture I could find, though I only had one tooth protruding. This week, Congress banned the slaughter of horses for human consumption (the Senate would still have to act before anything would change). There are three slaughterhouses in the U.S. which kill horses for export to places like France and Asia, where some people eat horsemeat. The average American seems to be repulsed by this practice. I think the ban is a good idea too, in theory. The reality is that many horses will just be driven to Mexico or Canada for slaughter, where the misnomered “Humane Slaughter Act” won’t apply. That’s the U.S. law that says livestock must not be able to feel pain when they are killed. Sounds pretty good, right? Well, in the case of horses, an acceptable way to render the horse unable to feel pain is to shoot a bolt into their brain, or to use a rifle or a stun gun (none of these kill the animal). Then they are hung upside down and the throat is cut. Meanwhile the horses are watching each other die. Tangent: The Humane Slaughter Act applies to “livestock.” Conveniently, there is a separate poultry designation (chickens, turkeys, rabbits of all things), under which the animal can just be killed while conscious. The whole thing makes me sick. I guess we are solving the U.S. slaughter of horses by creating an equally ridiculous problem–ship them farther under stressful conditions to other countries where the slaughter will be worse, and continue to not prosecute those who do not care for their animals in our own country (some folks may abandon their horses or attempt to kill them themselves if options like slaughter, where they are paid to send their horses away, are reduced). Perhaps if we as a society learned to value other creatures’ lives enough to treat them with respect– to live out their lives or to provide a truly humane death– we wouldn’t have to wrestle with these “problems” of slaughter. “It is one of the most inhumane, brutal, shady practices going on in the U.S. today,” said Rep. John Sweeney, R-N.Y., a sponsor of the ban. Sweeney argued that the slaughter of horses is different from the slaughter of cattle and chickens because horses are American icons. “They’re as close to human as any animal you can get,” said Rep. John Spratt, D-S.C. I agree that our society’s morals are reflected in how we treat our animals. What I don’t get is why a horse is any different than a cow or a chicken. This bill does nothing for all the horsemeat in petfood or otherwise used for non-human consumption, BTW. 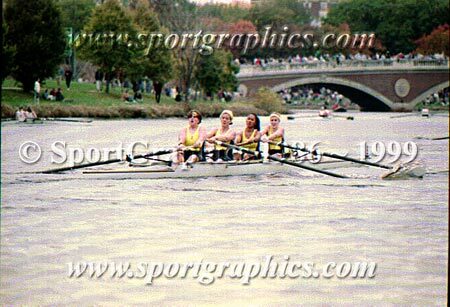 Head of the Charles 10-21-95. Ooh, I made it to 3 seat! Comedian. The bow seat creates a strange fatalism. They know that in a catastrophic collision, they’ll be the only one to die or get paralysed. Consequently there is a constant quiet stream of one-liners that two or three could probably hear if two were not cheering loudly. 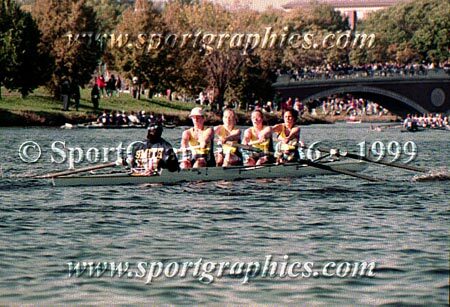 If the bow is joined by a cox in a front-loader, this trait completely disappears, since someone is now likely to hear him joke about three being late, five not pulling hard, or the coxn’s course looking like a signature. (S)he can be humorless and witless off the water, but on the water when there is breath to spare, you’re sure to catch a chuckle if you listen. David and I went to a picnic at the boathouse on Labor Day. Deb made sure to bring a vegetarian fiesta salad (yum! 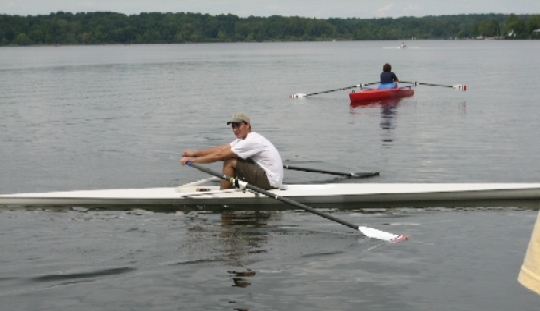 ), I finally learned to make hummus, and David learned to row! I raced in a quad with Peter, Jill, and Whitney (I’m in the green shirt). 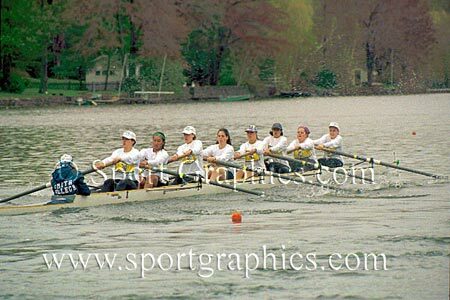 We won the first two races against the eights but were too tired to threepeat. 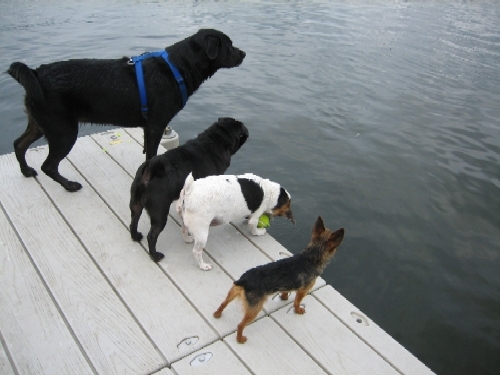 The dogs were anxious for their human pals to come back to the dock! I liked this guy so much I had to give him a home here. Edit: This guy came from veggieboards.com, where you can find other dancing fruits and veggies!